2019 AFPSAT Review Materials & Practice Exam for Army Aspirants #PDF - Exam News, Reviewer, Military Career, & Everything [MN] . . The Armed Forces of the Philippines Service Aptitude Test or also known as AFPSAT is a unified written examination which is a pre-entry requirement for Army, Air Force, and Navy (Marines) aspirants. Selection of men and women in the Armed Forces of the Philippines using psychological testing has long been used and remains an indispensable part of the Neuro-Psychiatric Screening. One of the qualifications being sought is aptitude towards pre-entry training and subsequent service in the military. The AFPSAT examination fee is free and in order to qualify for the exam, aspirants should meet the basic qualification standard and requirements of the AFP indicated below. For Officer Candidate Course (OCC), one has to be a baccalaureate degree holder, natural born Filipino citizen, 21 to 29 years of age upon admission (no age waiver), single, never been married and never borne or sired a child, not less than 5’0 ft. (152cm) but not more than 6’4” ft. (193.04cm) in height for both male and female, of good moral character and physically, mentally and psychologically fit for active military service. For Officer Preparatory Course (OPC), a natural-born Filipino citizen, inactive Commissioned Reserve Officer who were commissioned in the Philippine Army under Circular 4 Groups I and II, must not over 31 years old on the date of Called to Active Duty (CAD), a baccalaureate degree holder, physically, mentally and psychologically fit for active military service, not less than 5’0 ft. (152cm) both for male and female but not more than 6’4” ft. (193.04cm) in height and of good moral character. Likewise, qualifications for Candidate Soldier Course (CSC) are the following: natural born Filipino citizen, at least 18 to 23 years old before the date of appointment as candidate soldier (no age waiver), at least high school graduate but possesses technical/vocational skills needed by the AFP, not less than 5’0 ft. (152cm) both for male and female but not more than 6’4” ft. (193.04cm) in height (no height waiver), unmarried and without a child, of good moral character and physically and mentally fit for military training. All major service shall henceforth recognize the result as valid and said applicant need not take the same test if he/she applies in another branch of service within the period of three (3) years. 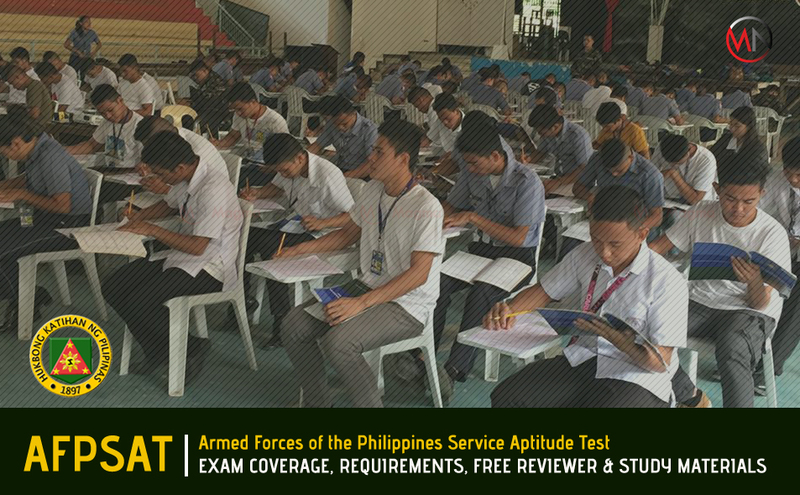 The AFP does not offer any reviewers for AFPSAT and unlike other proficiency tests, you can rarely find a review center that caters review courses for military exams in the Philippines not even for PMAEE and PNPCAT. However, if you're resourceful enough there are tons of study materials online where you can use as a reference for your review. Below are some of the supplement review materials with high relevance to AFPSAT exam coverage. You can download it for free and start answering the practice tests at your convenience.